Detroit came near a half a foot ( 5.0"). My area was at 5.7". It was a nice snowstorm. I believe Snowfall tally so far this Winter in Detroit is roughly at 58". Impressive indeed. More snow next week. Last night's euro was the coldest run, yet, for the week following the Monday system. As much as I want to see warmth and thunderstorms, significant stretches of chilly weather are something we have to put up with in March. The ensembles bring us back to 50 by mid month. '17-18: 39.5" '16-17: 17.9" '15-16: 20.0" '14-15: 30.4" '13-14: 48.3" '12-13: 34.1"
Remember the first wave of the big multi-wave snow back on February 8th? It had a razor-sharp southern edge here in Iowa. The big snow bullseye was the Fort Dodge area, which received 11 inches. The rest of the snow pack from that period is long gone, but that one spot is still there. 12z Euro driving the next monster trough right into the SW/4 corners region Day 7-8 and fits the pattern like a "glove"...let's watch the models handle this energy as I've had this period circled on my calendar. If anything even close to that comes true I'll dance naked in Joe Bastardi's front yard. Busy week of tracking strong winter storms and not the severe wx some people on here want and hope. I really doubt we get any severe wx until prob late March and that will likely still be in the southern Plains. 5% RH in Goodland, Kansas. Yikes. Storm is a bit farther south this run. Meteorological Winter wrap at Grand Rapids, MI. the average temperature for December, January and February was 26.4 degrees. The warmest temperature in G.R. was 63 on Feb. 20 and the coldest was -12 on Dec. 27. We had 9 days when the temp. got to zero or colder and 46 days when the high temp. failed to get above 32°. Grand Rapids had 9.01″ of precipitation and that was 2.63″ above average. The most rain in one day was 2.53″ on Feb. 20. We had 52 days with measurable precipitation. Grand Rapids recorded 66.2″ of snow and for that 3-month period. The most snow on the ground in G.R. was 10″ on Dec. 16, Feb. 11 and Feb. 12. Grand Rapids recorded 29% of possible sunshine and there were 3 days with a thunderstorm. The average wind speed was 10.4 mph and the peak wind gust was 56 mph during the early morning of Sun. Feb. 25th. All in all meteorological winter 2017/18 was a typical winter here in Grand Rapids. The biggest event was the flooding in late February that was more like one would expect in March or April. Sunny n cold w a nice snowcover around w temps in the 30s. More snow for next week. Ugh! I am looking forward to severe weather. The 12z Euro crapped out our potential big weekend system, instead bringing all the energy together for yet another big nor'easter. Why do you want a big system now?? Cuz we're not all like you. 75 degrees, humidity 15%, south winds gusting over 30 mph and in a high wind warning for Monday with winds potentially 60 mph. Precipitation chance 0%. Yippee. Big Nor'Easter again for the EC. This time it will be a colder storm, which means, that the coast might be in for a lot of snow and wind. 8 pm on March 4th and the temperature is still 61 degrees. It feels like an early summer evening outside. I think it's gonna be one of those summers with a bunch of mid 90 degree days and low dews and little rain. Hope I'm wrong but I think it's gonna be a drought year. I hope you’re wrong, but all of these misses with storms doesn’t make me too optimistic. 10 pm on a Sunday night and we have the windows open. Have not had the heat on since Thursday. Insane. EC is in trouble again. It's just so easy for all the ingredients to come together to produce a big nor'easter. They just had a huge one, they'll be getting another one in a few days, and then probably another one next weekend. Meanwhile, we go years without a single major system. Meantime, not this weekend but the following weekend, just before the Spring Solstice (which I'm eye balling a Spring Solstice Storm) there will likely be a brief intrusion (2-3 days) of warmth. I'm expecting a hard-cutter through the Dakotas into the Upper MW region which should tug up some real nice warm weather out ahead of this system before it cools back down. What happens after the following weekend leading up towards the Spring Solstice could set the stage for another wild looking storm. This post may be more focused for the central Plains posters who are looking for better chances of tracking a beneficial storm to hit their area. The one (and I do mean 1 storm), as sad as it sounds, that I anticipate to bowl across the southern Plains is the system that back on Halloween ejected out of the 4 corners region. However, this part of the pattern isn't expected to arrive until just beyond the 2 week period. Euro weeklies are showing something. Looks like our one and only shot at a soaker till at least mid-April. Interesting, I haven’t seen the Euro weeklies since last Monday. Curious how today’s weeklies turn out. 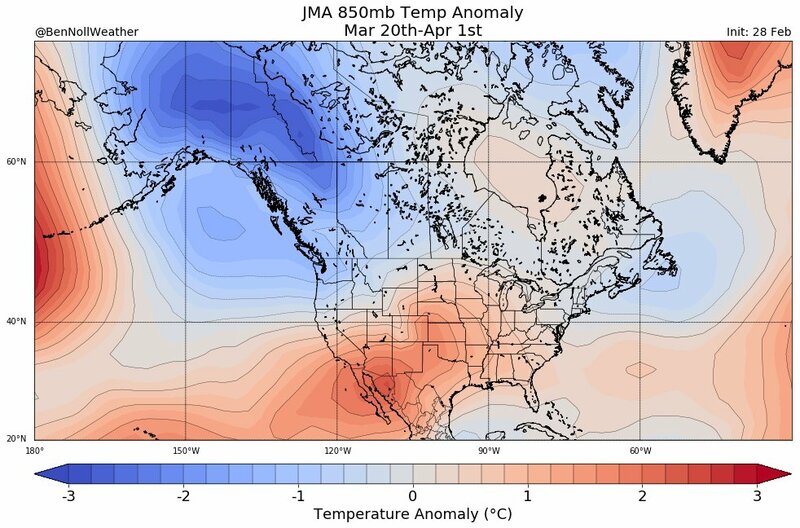 Cold finish to this month and cold start to April is in the cards and may set up a nice battle ground across your area which is something to look for down the road. Sunny and brisk w temps in the 30s. Some snow later tomorrow into Weds w minor accumulations. Some could be more substantial. Big snowstorm for the EC. Winterstorm Watches posted for the NYC area northward for 6-12inches. Cant wait to see their snowfall Winter total. They are doing good so far w above normal snowfall. Apparently, this model likes my area for heavy snowfall. East coast could blink and get a foot of snow. Well regardless of what happens with the weather this summer, it seems like Nebraska will have a very healthy harvest of sour grapes. I guess I forget that other areas of the country still have winter going on right now. Lol. Congrats on a great snow season buddy. Today's 12z GEFS basically are listening to my thoughts for the longer range, warm period prior to the 20th, then the cold comes back after a Spring Solstice Storm....and I think the cooler weather will stick around for a little while. Southern plains warm up bigly. Thanks man...wish I can mail you some snow. Believe me, I want no more of it. Had too many snowstorms already. Looking forward to Spring and severe weather alerts. Spring mode has kicked in. Yeah I just hope things turn around for us out here. It's pretty dry. It feels a lot like Spring 2012 which was a nightmare of a year. If we miss out on severe weather season then I'll be even more upset. A hot and dry summer here would be the death of us. Your always welcomed out here my man! Boat parties at the Play Pen bud....Oak St beach, summer festivities....fun times! While we see the big storms to the west and east of us in the central Great Lakes my advice (it may or may not happen) is “Beware of the Ides of March” or look for a active storm period from March 15th to the 22nd note this is just an old saying in my neck of the woods. I'd take about 20 dump trucks full if you could send it. Someone else can have the severe weather. I live in an area that favors night tornadoes so not as much a fan as I used to be. through this time as mid-level impulses rotate through the area. 12z NAM crushes SEMI. Dang! I hate to move on from this last event so quickly, but GFS is trying to put together something around the 17th. GFS looks like it does not want to give into spring, at all, at least for those of us above the wisconsin/illinois and michigan/indian state lines. Something to watch as we get a little closer. March is a violent month. It can be all four seasons. RGEM is showing 5.9”/hr snowfall rates and over 2ft of snow of the region. NYC gets buried. Near a foot and a half for NYC. Dang! This will be a massive snowstorm, perhaps some places will get a HECS.